Isabella Furtado is a 5th grade student at Silva Valley School. Her teacher, Kathy Holliman praised Isabella's consistent cheerful willingness to do all the tasks assigned. "She never says the more typical 5th-grade response, 'Do I have to?'" 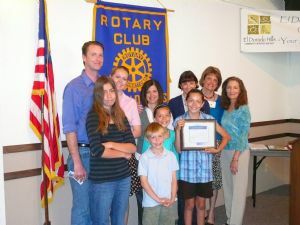 Isabella received a bond worth $100 from the EDH Rotary club. Her family joined her at the Rotary meeting. Front row, left to right: Brianna Furtado, 12; Jesse Furtado, 7; Jessica Furtado, 11; Isabella. Back row: Kevin Glavner, father; Kassy Furtado, mother; Kathy Holliman, Silva Valley Principal; Amber Hyde, 5th grade teacher; Terry Wenig, Buckeye Union School District Superintendent; Kathy Witherow, Rotary President.